A recent topic making its way through the Amazon private label seller world is the rise of Amazon listing hijackers. Earlier this year we covered some methods to protect yourself from Hijackers. However, since that time, there have been developments with how listing hijackers can undermine your business. 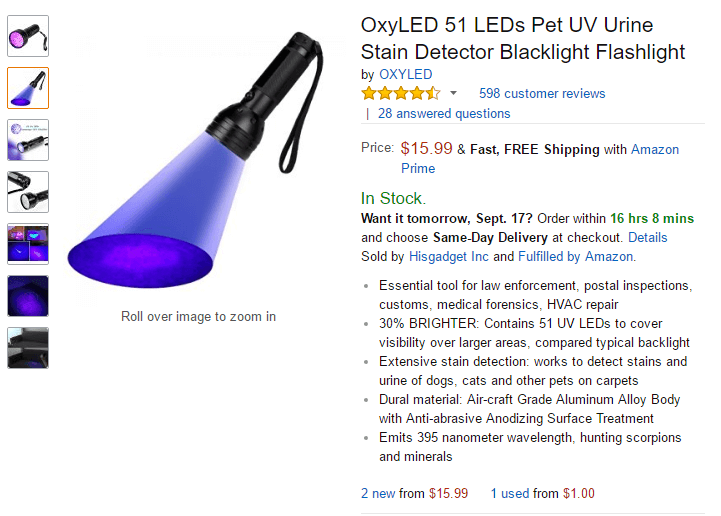 Amazon listing hijackers: they’re an Amazon seller’s worst fear. After you’ve put in weeks of hard work to manufacture and market a product, an opportunistic competitor swoops in with a cheap knockoff, leeching off of your listing’s success and stealing your sales! Luckily, these easy steps can help safeguard your listing from hijackers. We’ll also share some tips about what to do if your listing has already been hijacked. Let’s get straight into some prevention tactics. Add something to your listing that makes your item a pain in the neck to duplicate. Nothing too fancy; what’s important here is that it’s a simple add­on from a different factory. This way, if somebody wanted to duplicate your listing, they’d have to source items from multiple factories rather than just knock off a single item. The listing above would be relatively easy to hijack… which is probably why there are two other sellers on their page. 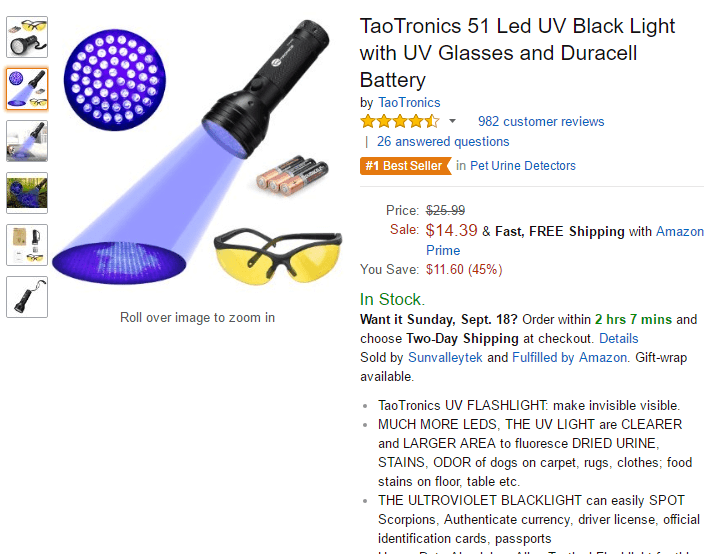 There is almost nothing that sets this listing apart from any other UV flashlight. Now this is the sort of listing that would make a potential hijacker head for the hills. The creator most likely asked the factory to throw in the Duracell batteries, and they found an inexpensive set of safety glasses they rebranded as ‘UV Glasses’ as the added bonus to their bundle. There does not seem to be any additional sellers hijacking this listing. To secure your product even more, don’t allow the add on item to be bundled together by your main factory. We’ll explain this more in Step 4. Step 2: Brand! Brand! Brand! A brand name and image featured prominently in your product photos makes it much harder for hijackers to pass off phony duplicates. Notice in the examples above how the first listing has no branding in the photos, whereas second listing displays the brand image on the product itself. Registering your brand with the Amazon Brand Registry is another way of throwing up a roadblock for would­be hijackers. By registering, you’ll have more control over things like the title and details of your listing. And if anybody steals your brand or counterfeits your product, you’ll be able to file a claim with Amazon to have the fake listing removed. Finally, consider filing for copyright or trademark protection in whichever country you intend to sell your products. This way, in addition to pursuing the hijackers under the Amazon terms of service, you’ll also have some legal recourse. Even if you don’t go all out and hire a lawyer to send a cease and desist, sending a strongly worded letter or email yourself, referencing the laws that are being violated by the hijacker, is often enough to cause them to slink back into the shadows and leave your listing alone. Ever hear of the word Guangxi? 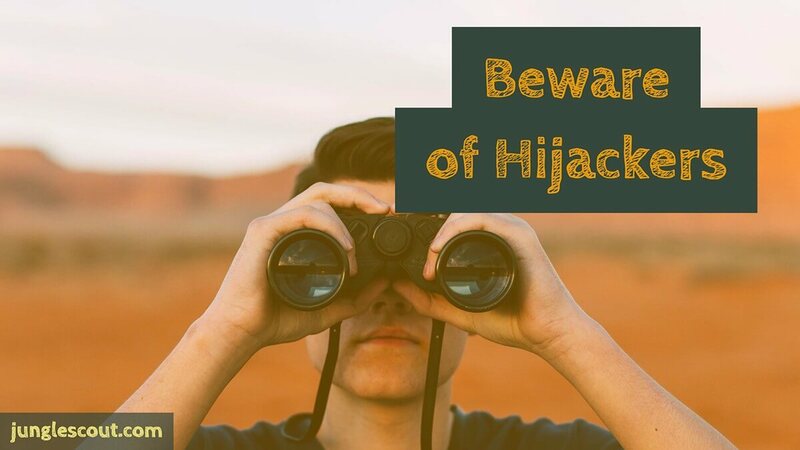 It’s a Chinese word that means “connections” or “relationships.” By strengthening your business relationships, your suppliers will be more likely to warn you of any possible hijackers lurking around. A lot of sales agents are young adults in their early twenties who learned English in a local Chinese University and have had little access to foreigners in their hometown. Sharing your culture and having genuine conversations with them are simple ways of building your relationships. While you may not develop the same levels of guanxi as you would if you lived close to them and met for dinner and drinks, your relationship might give you an ace in the hole for warding off hijackers. At Guided Imports, we work with a lot of Amazon sellers, helping them get their products sourced and made in China. One of our clients sent us a product specification sheet for their product they wanted to manufacture. The first thing we do with all new orders is to create a manufacturing feasibility report. This is where we provide estimates of all costs associated with manufacturing. We do this by reaching out to a handful of suppliers to begin building this report. On this occasion, one of our sourcing agents got a cease and desist letter from the Amazon best seller of this exact product. Looking over the letter with our legal staff, we determined that it held little legal weight, and it wasn’t enough to scare us off. But what it did do was let us know that one of the five suppliers we reached out to has such a strong relationship with the Amazon seller that the sales agent tipped them off that we, a sourcing company based in China, were interested in competing on Amazon with their client. This relationship was so strong, that the sales agent was willing to forfeit a possible sale just to please their client. This is the level of guanxi you should try to develop. Don’t expect to command this level of loyalty within your first few orders. It can take months or years to build the such a strong rapport with a supplier, but it’s clearly worth the investment. The is both the most important factor in avoiding hijackers and the most commonly neglected by Amazon sellers. So, what’s so bad about these phrases that most Amazon sellers are quite familiar seeing? They reveal your entire supply chain to your factory! Never let a factory know you’re selling on Amazon! In case you have not yet realized it, it is incredibly simple to sell on Amazon. This is the reason so many businesses are seeing decreased sales and increased competition. It’s so easy, anyone, including a part­time factory worker, can open up an Amazon seller account and start selling, especially when they have proof that specific product coming from a specific location is successful. The first step is to break up the relationship your supplier has with the end user. The moment you send your supplier an FNSKU label, you’ve revealed way too much. Lead your supplier to believe you’re a small mom and pop shop selling these out of your corner store, not an Amazon seller. Next, find a company or person you can trust to handle your packaging and labeling. If you have your factory ship your goods without them seeing the box or the labels, you’re making the overall process more difficult for them to determine your end user. This makes it more difficult to hijack your listing. Keep in mind that although Amazon is a huge market, it only represents a tiny fraction of the goods being produced in China. So for a lot of factories, it’s not going to be blatantly obvious to them. Without a doubt, importers can save money by having packaging and preparation done in China. But the added security of getting your products out of China as soon as possible can be worth paying a bit more. Many sourcing companies offer in­house packaging and prep. Usually, they’ll have their own facility where goods can be consolidated, labeled and boxed without exposing them to prying eyes. Not everyone uses sourcing services, despite their ability to not only save importers money but also to protect their brand. So, the next option is to use a packaging and prepping service in the country of sale. By shipping the goods loose to prep facilities and having them sign a nondisclosure agreement, you’re also preventing potential hijackers from connecting the dots between your supplier and your end user. While this is becoming an increasingly popular option for some, it can be quite expensive. You’re adding two additional waypoints into your logistics plan, and you’re paying for western labor to perform tedious jobs that could have been done in China for a fraction of the cost. But, for some, this is just the cost of doing business. In the event you are able to find a company in China that you can trust, you can have them pack and label your products according to Amazon’s FBA specifications. Another added bonus to someone on the ground in China doing this for you is that they can also individually inspect all of your products as an added measure of quality control. Regardless of the company you choose, it is important to only use ones that can both maintain your brand’s confidentiality and also pose no threat to you by selling on Amazon themselves. As the sourcing/product service industry grows, we are all beginning to see a lot of competition in the space of service providers, but a lot of them are also selling on Amazon. This is a huge conflict of interest. If you decide to take advantage of the savings China continues to offer, use a company that can assist with prep in China, who is also a registered company in a western country. This allows for easier navigation through the legal system if necessary. Do you, or does anyone on your team also sell on Amazon? Who will be handling my products? How can you guarantee they will not take my information and aid the competition? Where is your company registered? If I have an issue, is there a local entity I can deal with? Okay, but what about after you’ve been hijacked? Preventative measures are important. But if hijackers have already struck your listing, you’ll need to go on the offensive right away. Drop your listing price, now. It may hurt to do it, but some sales at a reduced price is a whole lot better than zero sales at full price. Stay competitive! Have a friend buy the hijacker’s product and then file an Amazon A-­Z Guarantee complaint for falsely advertised goods. If you have trademark or copyright protection, you can also consider pursuing legal action. In many cases, making legal threats is enough to scare a hijacker off; it’s rare to actually have to ­­or even be able to ­­ get a hijacker in front of a judge. It can be difficult to determine if your supplier was the culprit behind the hijacking. But you can inspect the hijacker’s goods and compare them to your own. Chances are, if the goods are exactly the same, then they were produced in the same factory. If your supplier manufactured a good product, apart from the fact that they tried to screw you over, you may want to keep working with them. But, there are some obvious risks with that. Regardless of whether you decide to work with the same supplier or not, begin sourcing a new supplier. It never hurts to have a backup supplier that could take over your production. If you decide to talk with the supplier about the hijacking, avoid any verbal attacking, insulting, or assuming. That won’t get you anywhere, and they’ll play innocent regardless of the truth. Instead, you can try playing dumb, but also informing them of your strength as the buyer. The above script can also be used even in the event you suspect the supplier of being your hijacker and you plan on leaving them. A message like this tells them you’re not afraid of hijackers and you are ready for the next one! Even if you do leave your supplier, don’t burn a bridge. Rather, get your next supplier ready first and make a slow transition with an initial test order. The last thing you want to do is ruin a relationship and be unable to find a new factory who can produce your products. Dealing with hijackers is an unfortunate reality for anybody selling on the Amazon marketplace. But by going in with a strategy for preventing hijackers, and having a plan to fight them off if they do attack, you’ll save yourself a world of inconvenience and lost profits. For more tips on staying safe while importing from China, feel free to check out the Guided Imports blog! What do you mean get their fees? Greg suggested having the supplier add the FNSKU labels and ship directly to Amazon. This article says just the opposite. Hey – it depends on how risk averse you are. The suggestion in this post is to help you prevent hijackers on your listing. Preventing your suppliers from seeing your FNSKU’s could help break up the links in the supply chain a little. But if you have a good relationship with your supplier, a good agreement in place and trust them, then it’s fine to send your barcodes to the supplier to print onto your products and packaging. The part of the post ‘make the production line difficult to follow’ makes a poor argument. If you’ve got a branded product and not just one of the many white labels that will soon die… you’ll have most likely your brand on the product and not just on the packaging. Preps services in that case don’t help and just make the supply chain longer… that means more time to get your product in front of Amz customers. Remember, when your supplier knows your brand it takes 5 secs for them to google it and get to your Amz product listing. A lot of speculation is happening around this topic but not too much clarity on exactly how they manage to take control. Kevin Rizer’s podcast explains this in some detail: “A new type of hijacker?” (http://bit.ly/2cmvACg). It seems like the biggest part of the problem is systemic. The fact that Amazon Retail’s listing contribution is rated higher than Brand Registered contributions makes it very attractive for hijackers to apply for Vendor Express and sell through Amazon Retail. I agree with your recommendations, especially step 4. Great article! To add, in the past few weeks, many sellers have reported this kind of problem. One type of hijacking that is happening is by “Amazon Retail”. Seems like this is happening because of loopholes in the new Vendor Express program. It looks like overseas sellers sign up for Vendor Express program and list products that will show up as sold by “Amazon Retail”. It does not matter then whether the original seller was Brand Registered on not because as part of the Vendor Express program, their listing contributions outrank those contributed by Brand Registered sellers. That just breaks the Brand Registry program and can totally threaten small businesses using the Amazon platform and this is a real problem. Thanks for reading and checking it out. Sam Boyd of Guided Imports gets all the credit for the article though. Thanks for mentioning the loophole with Vendor Express, that is very interesting, and agreed, it can be a serious threat to small businesses reliant on Amazon. That is an incredibly creative loophole. Can you confirm whether or not they are Chinese sellers or possibly factories doing this, or just wise hijackers taking advantage of easy to take over listings? Regardless of who it is, as I mentioned in the article, “Step 4: Make your production line difficult to follow.” should prevent against this, as it would take a lot of effort for someone to source a bundled product with items from various locations combined into the listing. just found this site whilst doing my research, just wanted to say wow, what a wealth of information. FBA is definitely the way to go. I used to think amazon affiliate was the way, but FBA is much more lucrative, more work involved yes, but the rewards beats 7% commission any day.